JDE, the world-leading coffee firm, has announced the launch of its coffee brand L’Or in the UK, according to an article in FDIN. Backed by a marketing investment of £8 million L’Or Coffee (meaning ‘Gold’) is described as a response to growing demand for higher quality coffee in the home and comes in instant, roast & ground and capsule versions. L’Or Roast & Ground Coffee reportedly uses JDE’s new Aroma Lock technology which enables the coffee to be packed immediately after roasting and grinding, said to maintain maximum aroma. In this format, the varieties available are Classique, Intense, and Elegant, each coming in a 250g brick pack for an RRP of £3.99. L’Or Instant Coffee, meanwhile, comes in Classique, Intense, and Decafeine (Decaffeinated) varieties in 100g glass jars for an RRP of £4.99. The Classique variety is also available in 200g jars and a 150g refill pack. 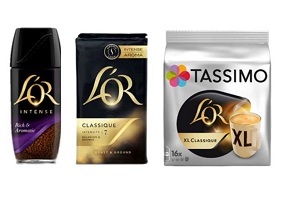 Completing the range, L’Or Tassimo Coffee Capsules will be available in XL Classique, Espresso Delizioso, Latte Macchiato, and Latte Macchiato Caramel varieties at an RRP of £4.49 per pack. Commenting on the launch, JDE UK marketing director Martin Andreasen said: “We recognised the importance and need for a luxury brand in the coffee category. With L’OR our ambition is to introduce a gold coffee standard UK consumers can enjoy in their home”. The L’Or coffee brand is also available in countries including France and Belgium.